SD Pharmaceuticals’ CISSUS 800™ delivers a solid 800 mg dosage of pharmaceutical-grade Cissus quadrangularis in every veggie capsule to support joint health and tissue repair! SD Pharmaceuticals’ CISSUS 800™ also includes the clinically-tested absorption ingredient, AstraGin™, to support optimal absorption! 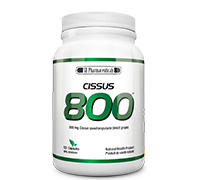 CISSUS 800™ comes in the form of an all-natural vegan capsule for those who want joint support without having to consume animal by-products, such as glucosamine. Cissus quadrangularis is a perennial plant of the grape family and is also known as Veld Grape. Perennial plants live for more than two years compared to shorter living plants (annuals and biennials) that complete their life cycle in less than two years. Cissus is native to India and Sri Lanka, but found readily in Africa and Asia. The beneficial effects of Cissus have been examined in a variety of research studies. 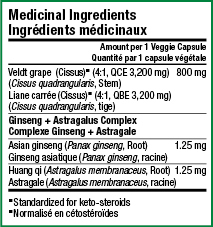 Cissus can help the body maintain healthy joints and bones, and even provides antioxidant and recovery benefits!